"He's a very good player," said Yocam, an 11th-year coach who won his first playoff game in five tries. got several good receivers around him." All of which means Leesburg's steak of 18 quarters without a point allowed appears to be in trouble. 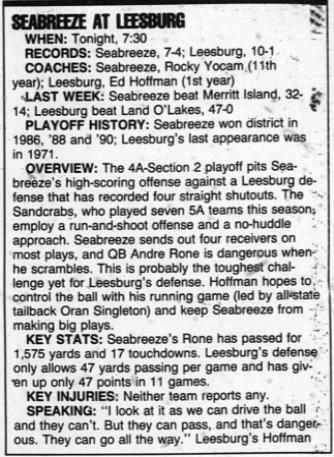 Class 5A opponents to Leesburg's One) scored 20 or more points in three of their four losses. could happen. We don't expect to (hold teams) scoreless until we're done with (the playoffs)."